Yann Guichard. Image copyright Chris Schmid/Spindrift Racing. 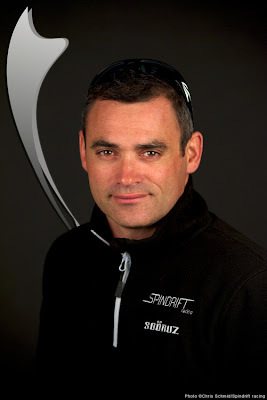 Yann Guichard said last night, during the Café de la Marine du Télégramme at Quai Ouest, Lorient, that Spindrift 2 (the ex-maxi tri Banque Populaire) will take part in the Fastnet Race this year. 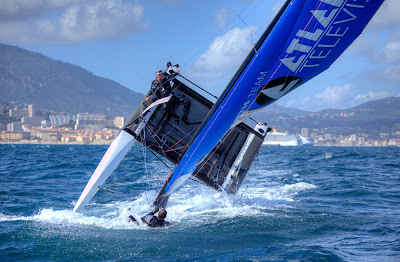 Guichard also confirmed that Dona Bertarelli, his partner in both life and sailing, has not previously done ocean racing. 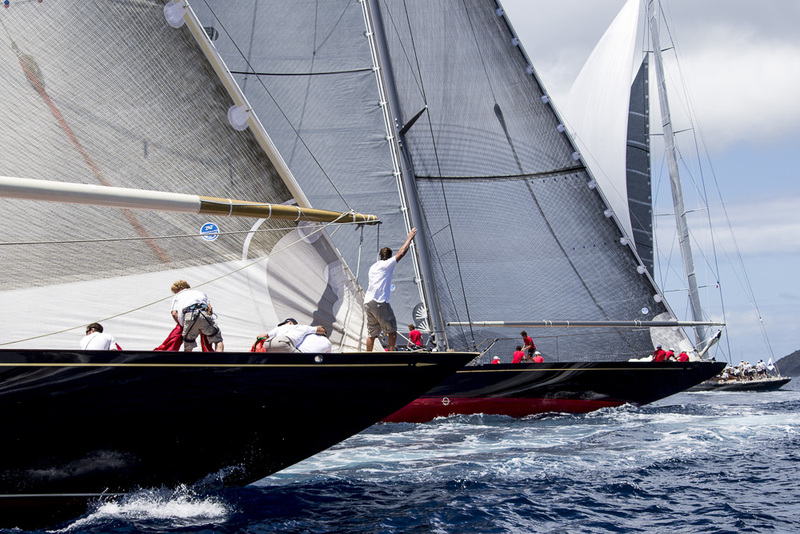 The programme for the maxi trimaran is only the Fastnet Race for 2013. Later, they will look at the Atlantic record and other records, but not the Jules Verne Trophy for the time being. 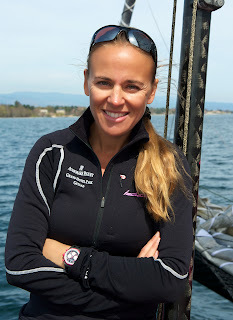 Dona Bertarelli, first female winner of the Bol d'Or in 2010, on board her D35 catamaran, Ladycat. Image copyright Chris Schmid/Eyemage. The Sprindrift MOD70 programme will commence in June, while Guichard and Dona Bertarelli will compete on the Ladycat D35 on Lake Geneva from May onwards. 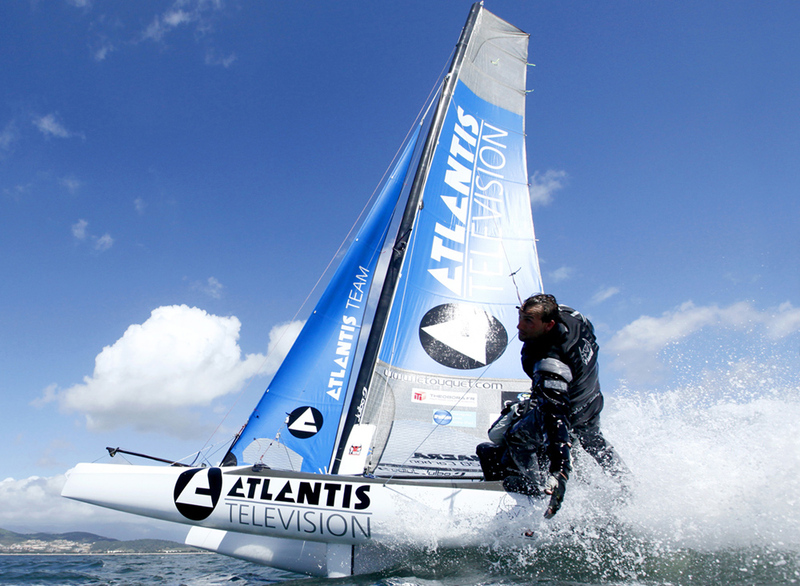 Spindrift Racing is based at La Trinité-sur-mer, but the size (mainly the width) of Spindrift 2 means that she is likely to be sailed out of Lorient. The aptly-named Prince de Bretagne 40 multihull (promoting fresh vegetables) eats a monohull for lunch in the JP Morgan Asset Management Round the Island Race. Image copyright Th. Martinez / Sea & Co.
1. It is never a good idea to modify a one design class in any way whatsoever; so-doing immediately turns the boat into a hybrid, rather than a one design. 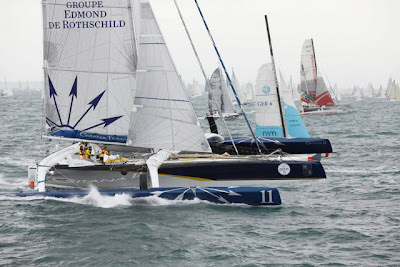 Yann Guichard also expressed disapprobation for any modification to the MOD70 one design when it was proposed to him by Pierre-Yves Lautrou at the Café de la Marine du Télégramme last night. 2. The current economic climate means that costs are all important in regard to getting boats on the line. 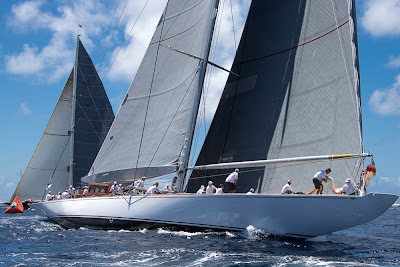 Sailors have commented to us that they do not believe that a one design IMOCA will be cheaper, but, rather, more expensive, than the present option. 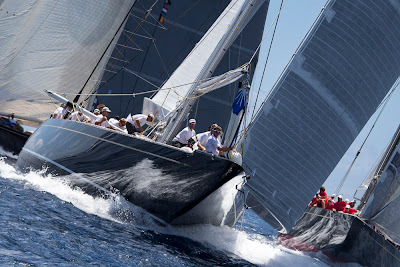 An MOD70 campaign is far more expensive again than an IMOCA60 one. Indeed, the crewed MOD70s are in need of a sponsor, as Guichard also pointed out at the Café de la Marine du Télégramme last night. 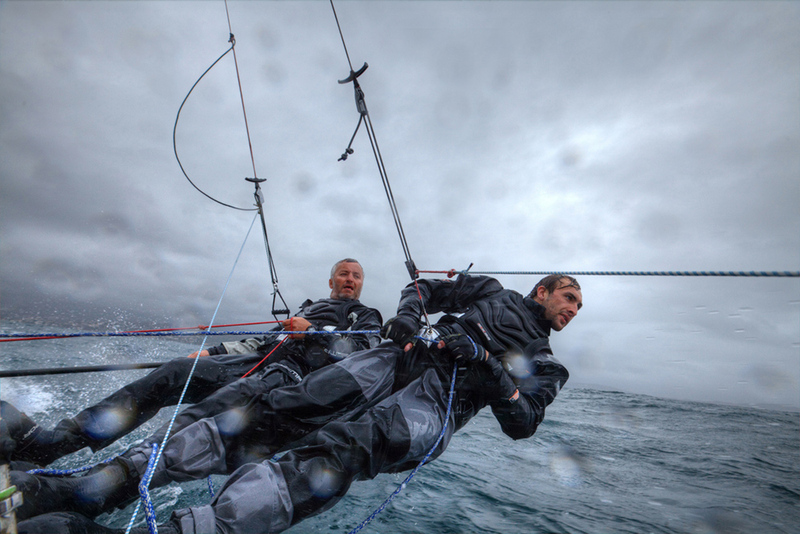 Hopefully the article did serve to give some exposure to the IMOCA60 and MOD70 classes. The intention with the MOD70 was always to provide crewed one design multihull racing around the world with stops, in similar fashion to the present monohull Volvo Ocean Race. However, the class has not yet been able to race worldwide, for lack of the necessary sponsorship. One day, when the economic climate is a lot better, there may be a possibility of an additional single-handed multihull race around the world, in which case a race in parallel would see the multihulls eating the monohulls for lunch, speed-wise, as is rather over-dramatised in the image above from the Round the Island Race in the UK, with the Prince de Bretagne 40 multihull. 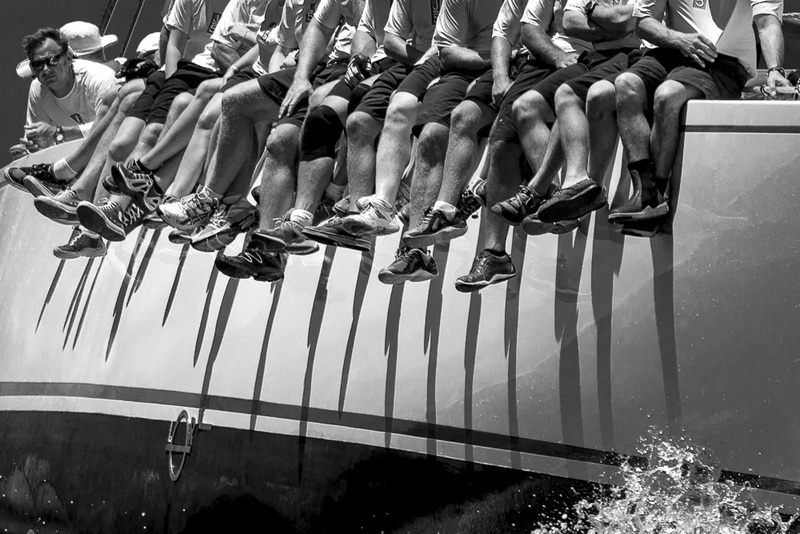 However, today, we hope that the Vendée Globe, in monohull IMOCA60s, will continue from strength to strength. The second article, written by Poisson d’Avril (the French for April Fool), stemmed from a wish to mention the achievements of Vestas SailRocket, which has the potential for 70 knots in its present set-up, if rumours are to be believed. 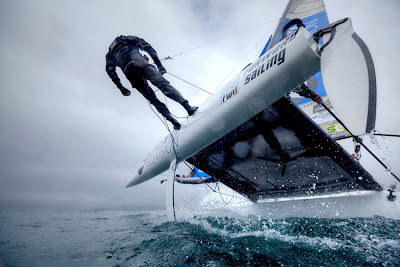 The word SpinDRIFT (pétole – on ne bouge pas) contrasts strongly with SailROCKET (Aller LA plus vite possible ! – as imagined from Jimmy Pahun at the Café de la Marine du Télégramme!! 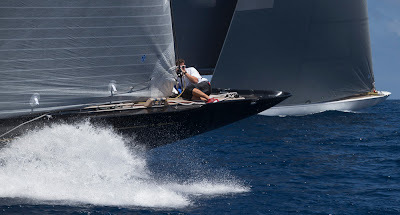 ), and of course Spindrift carries out part of its racing programme, in the D35 Ladycat, on Lake Geneva, where the Hydroptère is challenging for speed records. 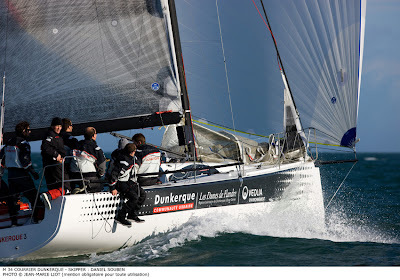 Courrier Dunkerque 3, winner of the M34 class at Spi OuestFrance - Intermarché 2013. Image copyright Jean-Marie Liot. Spi OuestFrance - Intermarché 2013 was one of the coldest on record, termed "glacial" by the locals in La Trinité. Single figure temperatures together with a significant wind-chill factor from the stiff northeasterly breezes made it "Southern Ocean" weather. There were eight entrants in the hotly-contested M34 class. 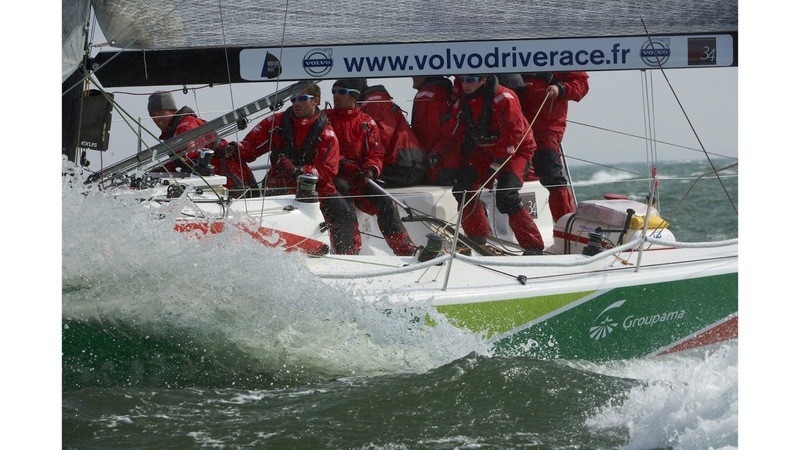 Courrier Dunkerque 3 and Groupama 34 had trained together for some weeks prior to the event, initially in Lorient and then at La Trinité. 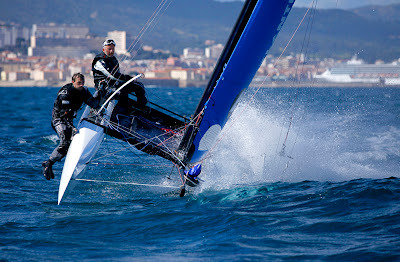 While France's current ISAF-top match racer, Pierre-Antoine Morvan, was on the Daniel Souben-helmed Courrier Dunkerque 3 from Friday for the inshore races, Franck Cammas and his crew had just won the French National Match Racing Championships, and the Thomas Coville-led Sodeb'O M34 crew had former top French international match racers Mathieu Richard and Damien Iehl on board; all formidable names from the sport in France. Groupama 34. 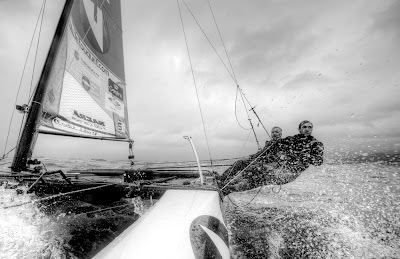 Image copyright Yvan Zedda/Groupama. The weather commenced cold, wet and relatively windy, and became more windy as the weekend wore on. However, the sun made an appearance on Easter Sunday and April Fools' Day, Monday. 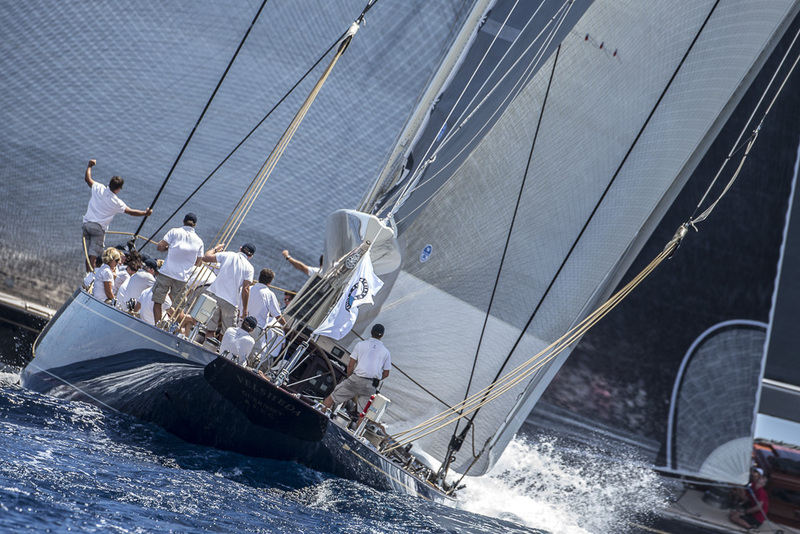 Although this did not improve the temperatures, it certainly coincided with an improvement in the results of the Oman Sail M34, who won a race on the Sunday. Daniel Souben's team on Courrier Dunkerque 3 started as they meant to go on - with a race win in the opening distance race on Thursday. 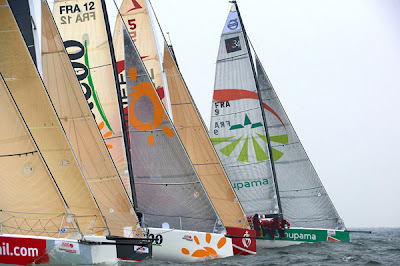 Sodebo was second in this race, and Groupama 34 third. M34 race start at Spi-Ouest 2013. 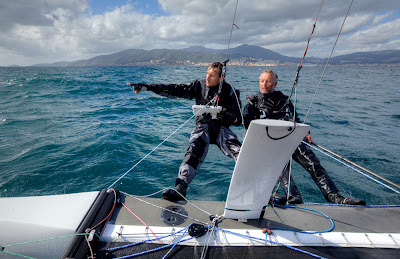 Image copyright Yvan Zedda/Groupama. 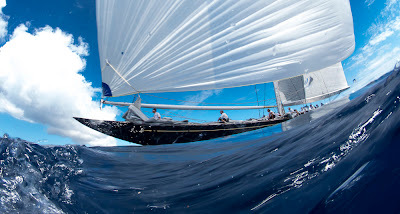 The Friday saw a torn spinnaker for the Groupama 34 team, which led to them missing two races as the rules required that they return to the pontoon to change the kite and the race officer did not wait for them to come back with a new sail before sending the fleet off again. Following this set-back, in true Cammas style, they returned with a race win! 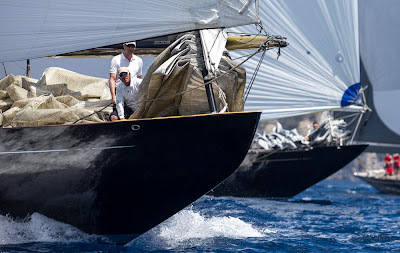 However, in their absence, Courrier Dunkerque 3 had notched up two more race wins!! Meanwhile, Friday was a day of consistency for Bretagne Credit Mutuel Elite, with three fourth places, leaving them in - fourth overall. On Saturday, Courrier Dunkerque 3 showed her consistency, notching up two race wins and a second place to Groupama 34's 2-4-3. The final race of the day saw the fleet anxious to get away - no doubt to get home to the warm. 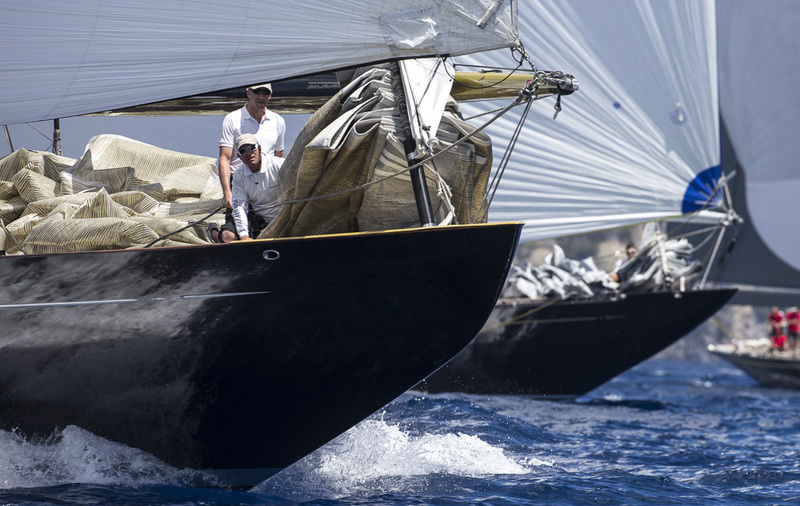 Both Sodebo and Oman Sail were disqualified under the Black Flag rule. At this point it seemed to be a three-way fight for second overall between Groupama 34, Sodebo and Bretagne Credit Mutuel Elite. 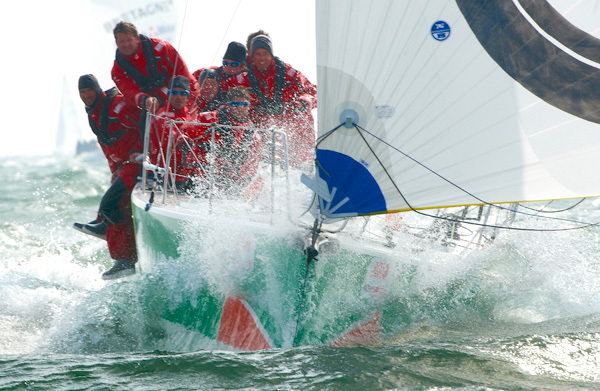 Groupama 34 in rough conditions at Spi-Ouest. 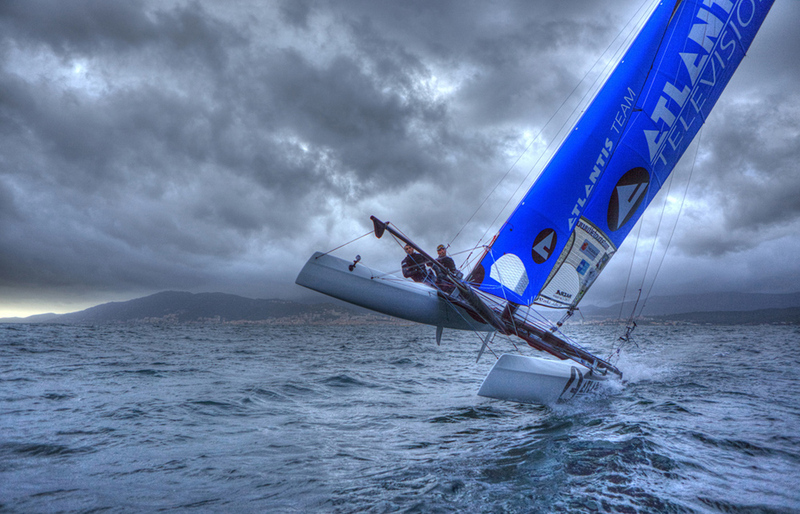 Image copyright Yvan Zedda/Groupama. Sunday brought brighter conditions. 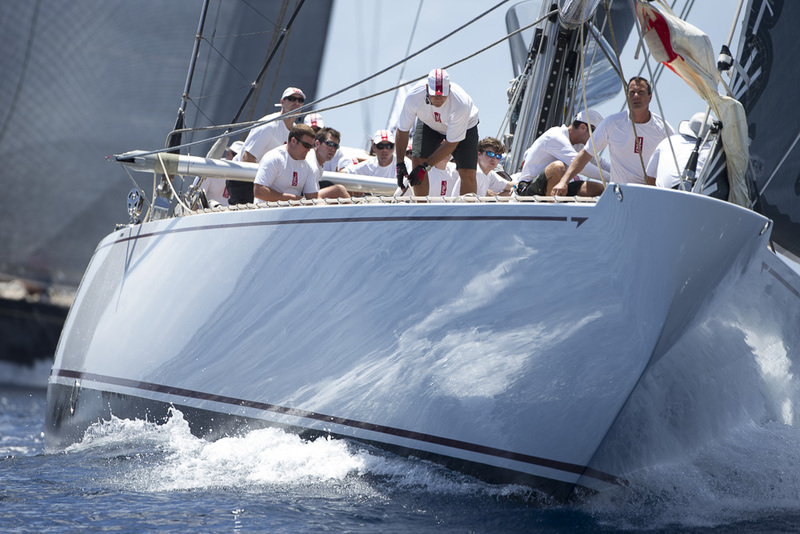 Groupama 34 was the top boat of the day, with 1-3-1, and Oman Sail shone as the second highest scorer on the day, with 3-1-2. The scorecards started to space out. Easter Monday, 1st April, had the sunniest weather of the weekend regatta. 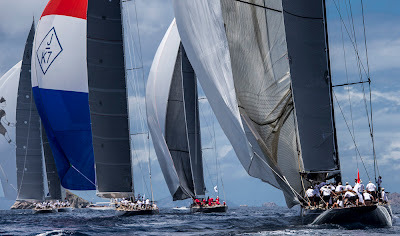 Groupama 34 was again the top scoring boat of the day with a 3-1, while both Bretagne Credit Mutuel Elite and Oman Sail had the misfortune to score OCS on the last race, following second and fourth places, respectively, in the first race of the day. 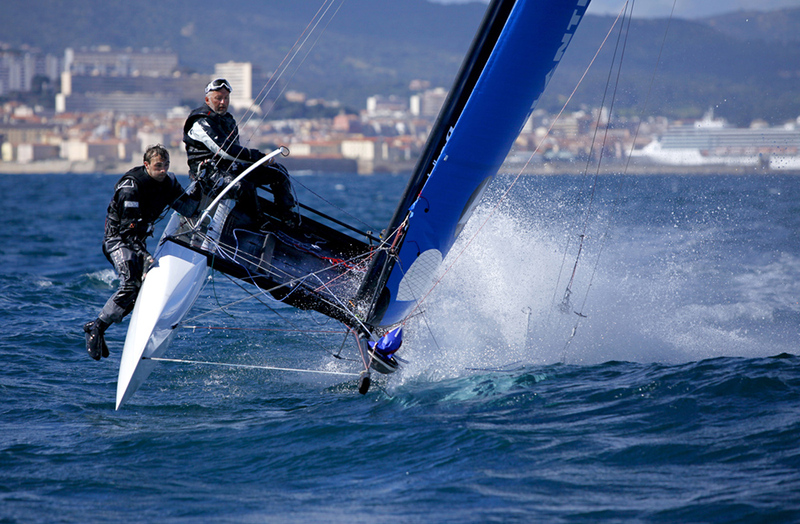 Close racing in the M34s at Spi-Ouest 2013. Image copyright Yvan Zedda/Groupama. 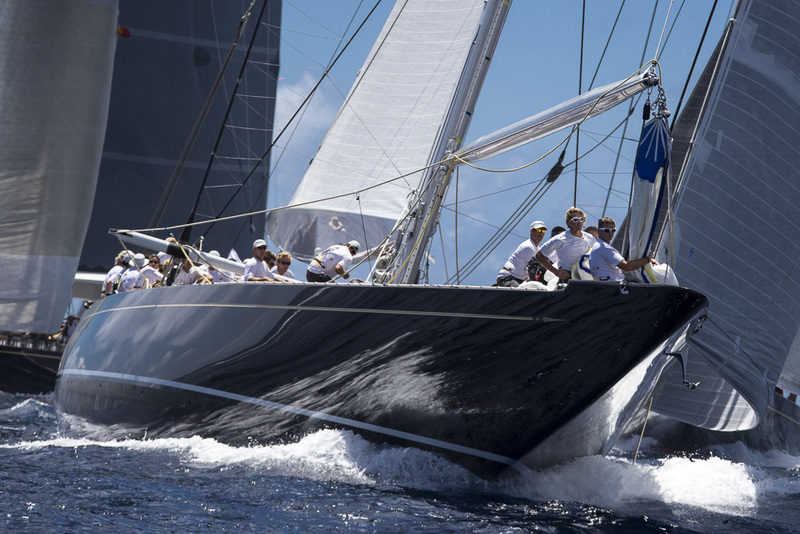 Courrier Dunkerque 3 was able to rest on her laurels on the final day of racing, and scored a fifth and second. 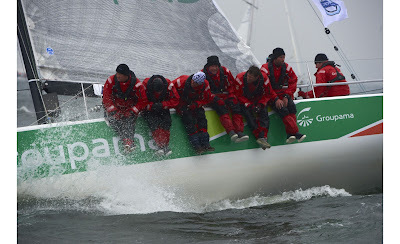 The fifth place meant that, in races completed, she had slightly lower consistency than the Groupama 34 team, as their worst was a fourth place in the regatta, but these two teams gave notice to all the rest that they are the ones to beat this season, both in the lead up to, and the Tour de France à la Voile itself. 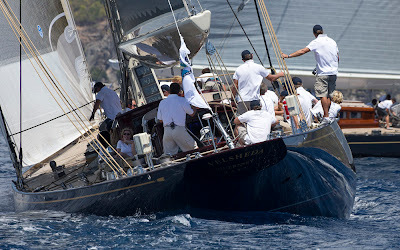 Hanumann, Lionheart, Rainbow, Ranger and Velsheda - will be sailing together for the first time ever in the Caribbean. 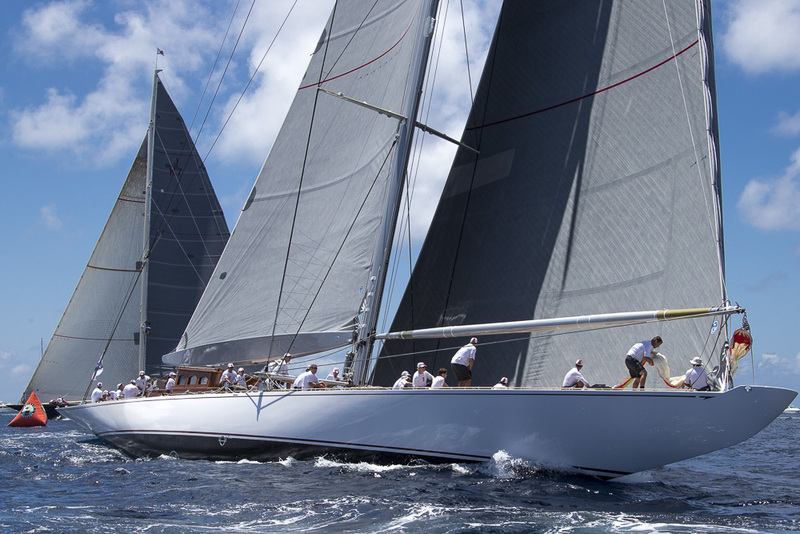 In addition, it will be the first time since the 1930s, considered to be the J Boats' Golden Era, that so many have converged for a single racing event. Tour de Belle-Ile : One Month to Go! Gitana 11 - Holder of the Course Record from 2011. 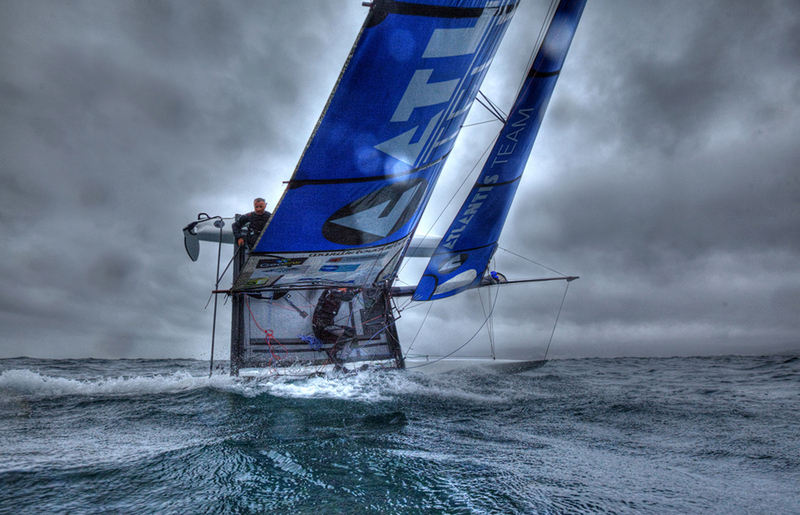 Image copyright Tour de Belle-Ile/Christophe Launay. The Tour de Belle-Ile is in just a month’s time! 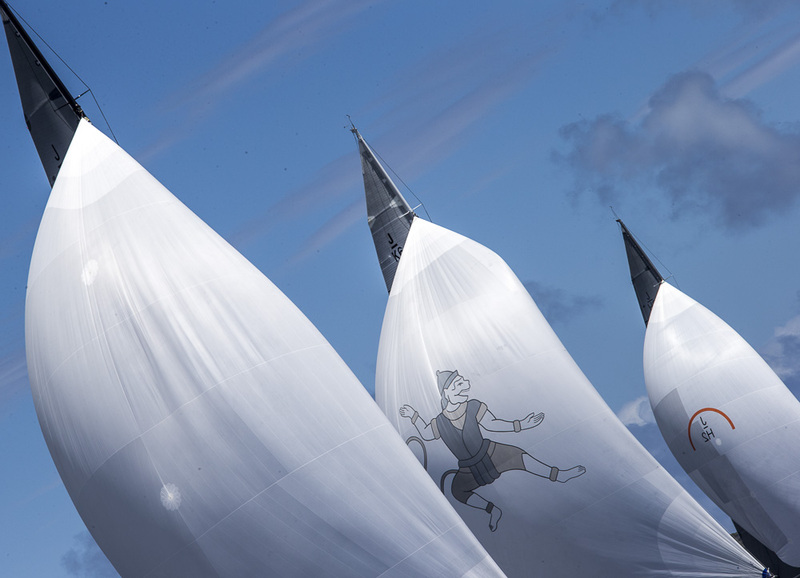 Amongst the hundreds of participants there will be celebrities of French sailing: Prince de Bretagne, Gitana 11 and the MOD70 Spindrift Racing. Further, Land Rover France has become a new partner of the Tour de Belle-Ile. And for those who are impatient, the last edition can be re-lived through images in the book out this week. 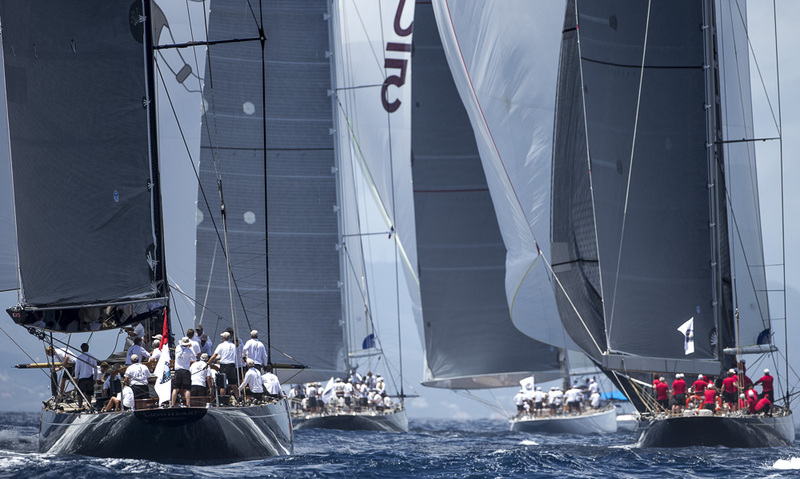 At present there are 258 boats entered – more than at this time last year. 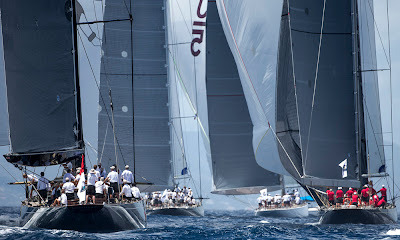 There were 486 boats in 2011, 504 in 2012 and will it be 550 in 2013? Amongst the most faithful, one finds Sébastien Josse on Gitana 11, who will try to make the triple, after winning in 2011 and 2012, and perhaps also beat his own record of 2 hours and 42 minutes for the 42 mile course of the Tour de Belle-Ile. 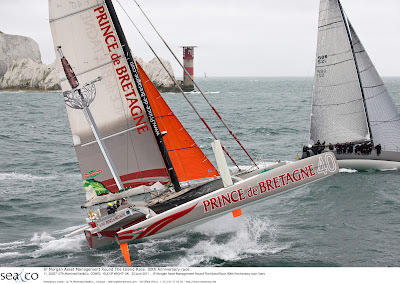 He can count on Lionel Lemonchois and his giant Prince de Bretagne, and the MOD Spindrift Racing of Yann Guichard, which boats he will come up against in Gitana 11 for the first time on this course. We also welcome Arnaud Boissières, 8th in the last Vendée Globe on Akéna Vérandas, and the 60 footer Sensation Ocean of Alain Gautier. In regard to the classes, there are strong entries from the First 31.7, Multi 2000, Grand Surprise and Pogo 8.50. The yawl Rose Noire II, Oriole and France 1 (a former America’s Cup boat, recently renovated) are rivals in the “classic” category and for beauty towards winning the prize of “Yachting Classique”. On the occasion of the sixth edition of the Tour de Belle Ile, Land Rover France approached the marketing agency Eol to take its first steps in the sailing world. “Land Rover is delighted to be associated with the sixth edition of the Tour de Belle-Ile. 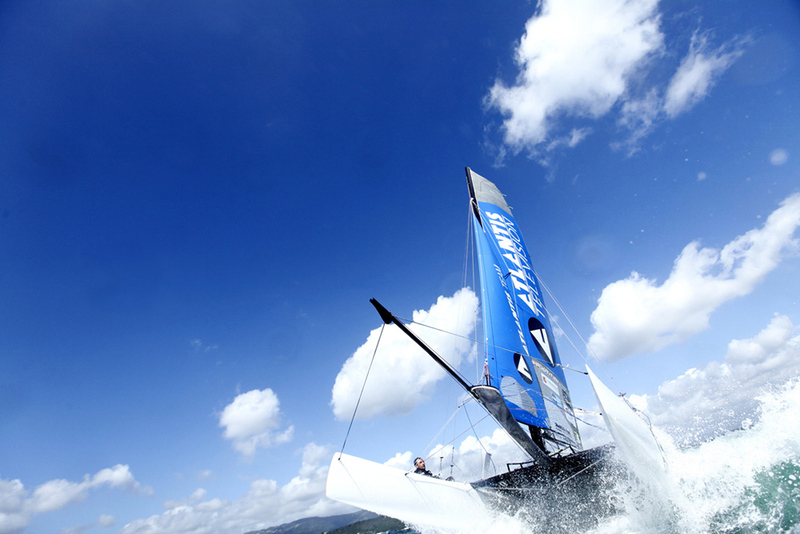 With the versatility of our vehicles, our brand is well suited to the sailing world. Adventure and conviviality, which lie at the heart of the Land Rover brand are the fundamental points which we share with the sport, synonymous with courage and escapism” explained Marc Luini, Executive Director of Land Rover France. Attempt to break the absolute sailing record of the Corsica (Known as the Beauty Island). 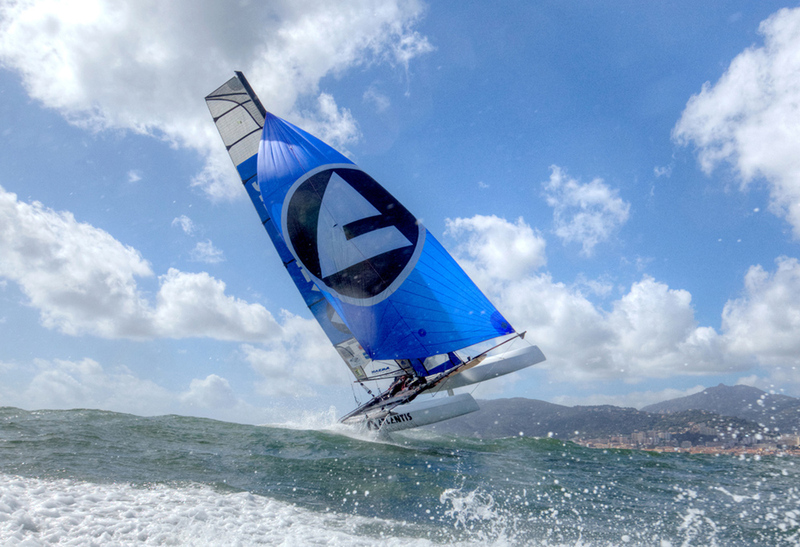 Island Tour Record currently owned by the TP 52 "Spirit of Malouen VI” in 30 hours 15 minutes & 18 seconds, on a Nacra F20 Carbon, a 20-feet-beach catamaran. 24th November 2012. This is the day that VESTAS Sailrocket 2 took speed sailing into a whole new era. 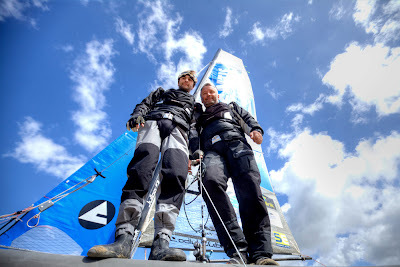 Having already broken the existing Outright world speed sailing record by the biggest margin in the records history a little over a week earlier, the team took to the waters of Walvis Bay in strong winds to try and be the first to take the sport over the 60 knot average mark. This video shows the third run of the day. The record attempt had been plagued by unusually light winds but they knew that on this day, Walvis Bay was going to deliver the goods. After 11 years of hard work on a 'roller coaster of highs and lows'... everything was in place for something big to happen. Founder and co-designer of the Sailrocket project, Malcolm Barnsley, had flown in to see his dream play out before his own eyes. VESTAS Sailrocket 2 has put a mark way up on the graph to show everyone what is possible. 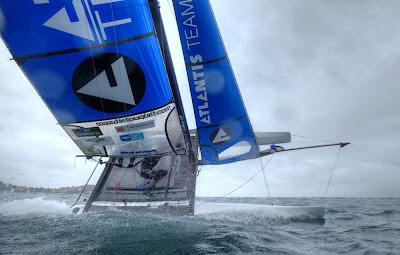 Vestas SailRocket later reached 65.4 knots - more again! This is the complete birds-eye view footage of Vestas Sailrocket 2 nailing the Outright world speed sailing record on 24th November, 2012. We had discussed the possibility of getting aerial shots for many years. The trouble is that there are no helicopters stationed anywhere around Walvis Bay in Namibia. 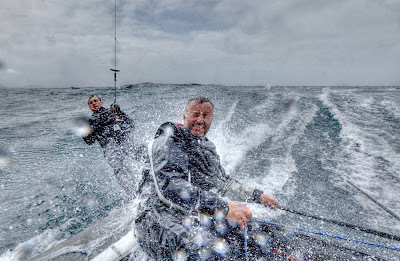 The fact that we are sailing in cross-winds of 25-30 knots adds to the difficulty factor. Swakopmund local, Bernt Bruns owns an RC model shop and we would often talk about the problem. He reckoned that he could do it with one of his RC planes which was modified to carry a GoPro in its nose. We were a little sceptical. As VSR2 began to hit its stride at the end of our last record session we all began to take it more seriously. Now or never. 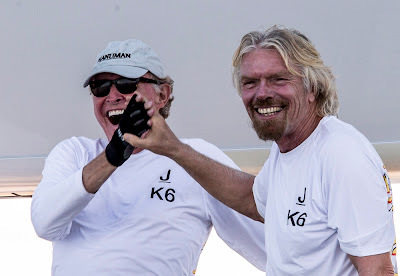 Bernt turned up on the last big day of sailing when we knew we were going to go all out. We dropped him off near the timing hut and got on with sailing the boat. It was an epic and historic day for us. I was faintly aware of what Bernt had been doing. Later that day as the triple rum and cokes and champagne flowed freely, Bernt downloaded the footage in our container at the Walvis Bay Yacht Club. He managed to film all three runs improving all the time. This is the final and fastest run. His plane does 110 kmh flat out. The timing for our 500 meter record run on the boat actually began as we pass the timing hut on the shore. We are doing over 120 kmh there and top out at 128 kmh. The plane can't keep up. There are many interesting aspects to this footage. You can see the angle that the plane has to 'crab' along at in order to follow us in the strong crosswind. Notice how this matches the angle of the fuselage on Vestas Sailrocket 2. At this speed this is about the angle of the 'Apparent wind'. I can also see that the low speed rudder has dropped down and is dragging behind the rear windward pod. I can see how much closer I could come into the shallow water and how the wave height increases off the shore. I love the rainbow in the boats rooster tail and especially love how far behind both the kitesurfer and the support RIB are considering we all take off together. Bernt did a brilliant job nailing this shot and assures me I won't beat his next plane. He refused payment. Capturing this great footage of a very difficult subject was the icing on the cake of an amazing day. Spindrift SailRocket for Lake Geneva! Vendée Globe : Change to Multihulls!